(VEN) - Dong Nai Province has achieved almost 50 percent of its annual foreign direct investment (FDI) attraction target by the end of the first quarter of this year. Dong Nai attracted almost US$490 million in FDI capital in the first quarter of this year. This includes US$190.5 million worth of capital in 21 new projects and US$297.4 million worth of supplementary capital for 21 ongoing projects meeting 49 percent of the 2016 plan. By this March, the province had 1,577 FDI projects with total capital of US$28.31 billion. Of these, 1,208 projects with total capital of US$23.79 billion are still effective; and 369 projects with total capital of US$4.52 billion have been withdrawn. Forty-three countries and territories have invested in the province, with Chinese-Taipei, the Republic of Korea and Japan leading the investment drive. According to the Dong Nai Province Department of Planning and Investment, most FDI projects are in support industries and utilize new technologies, appropriate with the province’s investment policy. In addition, adjusted projects are perse, involving capital transfer, business form changes, production, distribution and project expansion. President of the Association of Korean Businesses in Dong Nai Park Hyun Bae said that there are three major reasons for FDI enterprises and Korean companies in particular to choose to invest in Dong Nai. First, industrial parks, which are calling for FDI, have already complete infrastructure. Second, transport facilities are favorable, connecting with major transport networks nationwide. Long Thanh International Airport will be built in the near future attracting more investors. Third, an increased number of FDI businesses have invested in the province to make the most of preferences as a result of free trade agreements and the Trans-Pacific Partnership (TPP), said Park Hyun Bae. There are almost 300 Korean investment projects with total capital of more than US$5 billion in Dong Nai creating about 150,000 jobs. Dong Nai Province Department of Planning and Investment Director Cao Tien Dung said that many consuls general and foreign business associations have visited the province this year to carefully learn about provincial investment policies. Most of them have shown an interest in industries, real estate and agriculture. During her recent working visit to Dong Nai Australian Consul General in Ho Chi Minh City Karen Lanyon said several major Australian groups wanted to invest in industries and vocational training in Vietnam to take advantages of the TPP after it becomes effective. They paid attention to Dong Nai since the province is the gateway to Vietnam’s south-east. The Australian Consulate will help Australian businesses accelerate trade promotion in Dong Nai. Many global giants such as Hyosung, Changshin, Fujitsu, Formosa, Kenda and Pouchen have invested and expanded production in industrial parks in the province in recent years in order to increase links, build factories and produce materials and goods for the domestic and export markets. 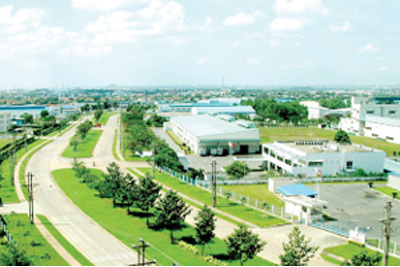 Dong Nai has planned specific investment areas in the province to meet demand for investment and human resources, while at the same time re-examining industrial parks in a bid to improve efficiency, and fostering green and complete development models for industrial parks. As for future years, the province will continue developing infrastructure to better attract FDI projects.